Over 5000 Johannesburg street traders have been left without an income for a month – parents and breadwinners who normally get by on a hand-to-mouth basis are now facing an unbearable situation. The havoc wreaked upon street traders lives is a result of the City of Joburg’s Clean-Sweep Campaign. A project championed by Mayor Parks Tau (ANC), the ‘clean-up’ has seen Metro Police remove registered and non-registered traders alike. After over 4000 street traders from across the city marched on the Mayor’s office on October 24, and a further march took place the following day, the Mayor’s office met with street traders’ organisations and march organisers, including the Workers and Socialist Party, on October 25. Together with the South African Informal Traders Forum (SAITF), the African Traders Committee (ATC), the One Voice of All Hawkers Association and the South African National Traders Association (Santra), WASP put up a simple demand: that all traders must be allowed back on the streets. Any cleaning or improvements in the city, we are convinced, could be undertaken with the street traders on site and participating. In response, the various MMCs present at the meeting claimed they were ‘taking back [their] streets’ and turning Johannesburg into ‘a World-class African City’. While they acknowledged that they had failed to communicate with the street traders’ elected representatives, they claimed that the ‘clean-up’ is undertaken in the traders’ best interest and that it would require their removal from the streets for another six weeks. For street traders, a total of ten weeks with losses – e.g through confiscated and destroyed stock – and no income will be completely devastating. WASP as well as all the street traders’ organisations have therefore rejected this. Further mass action will be called shortly. We are also considering legal action against the City. Behind the well-meaning façade of the City Council lurk very sinister real motives. During the Sep 25 meeting, Cllr Matshidiso Mfikoe (ANC), MMC for Infrastructure, Service delivery and Environment, argued that ‘people should work where they live’. On its own, this may sound like innocent common sense. But when echoed, as has been revealed to us through a report from an ANC member who attended an ANC branch meeting at Joubert Park earlier this month, by the ANC internally it becomes clear that this is code for ruling party patronage. According to the report, the local ANC has set down that to be allowed to operate as a street trader in a particular ward in the new regime which shall be built on the ruins of the livelihoods of the removed street traders, you will not only have to be a resident of that ward but you also an ANC member. In other words, the alleged clean-up is really an attempt to crush the traders and start a process of primitive accumulation, replacing them with ruling party loyals. The same ANC meeting reportedly proclaimed that it would put ‘our people’ on the streets, and it was said explicitly that ‘foreigners must go’. These shameful attempts at dividing the working and poor people of Johannesburg are also evident in the JMPD’s approach to the ‘clean-up’, which entails arbitrary arrests against any black African who is found without carrying an ID. MMC Mfikoe also stated that ‘just because these foreigners have IDs it doesn’t mean that we have to treat them…’ Xenophobia, racism, patronage, looting and corruption – these are the pillars on which the ANC is really basing its so-called ‘clean-up of Johannesburg, and its rule generally. It is this ugly underbelly of capitalism that should be cleaned away. As JMPD officers continue to harass traders and confiscate goods, in many instances irregularly – eg without issuing receipts, pocketing goods – WASP together with the various street traders’ organisations continues to mobilise for a people-driven clean-up. It is we who live and work in the City who need to take it back. The Workers and Socialist Party (WASP) has received reports from workers at Impala Platinum over corruption allegations against their trade union AMCU (Association of Mineworkers and Construction Union) representatives on shop steward level at as well as higher up in union structures. These allegations are of very serious concern to WASP, and we encourage AMCU to set up an investigation which must not only involve union officials but also a team of rank-and-file AMCU workers, who in our view should play the leading role in examining these claims in a transparent way. Mineworkers have flocked to AMCU to escape the corruption and treachery within the National Union of Mineworkers (NUM). They need a union where getting into the pockets of the bosses is not only unthinkable but also made impossible through solid, democratic structures at every level – shaft, branch, region, province and national – and a ban on privileges to ensure that shop stewards and other union officials share the living conditions of the members they are elected to represent. This is what WASP has consistently encouraged workers to strive for in taking control over the building of AMCU, as well as other unions. As Marikana made clear, the task that has been thrown onto the shoulders of workers in South Africa is to rebuild and revive the entire labour movement on the principles of worker control, struggle and socialism. WASP is not calling on the Impala management or the police to investigate AMCU or its shop stewards. We believe union officials must account to the rank-and-file members and that is the workers who must drive any investigation into misconduct. Zero-tolerance for class collaboration, corruption and anything ‘about us without us’ will be critical for the maintenance of fighting unity as AMCU takes on the platinum giants in a battle for a R12 500 minimum wage. WASP wishes the union all the best in this struggle. As always, we will be active participants in and supporters of the upcoming strike action. Over 4000 street traders from across the City of Johannesburg today marched on the offices of Mayor Parks Tau (ANC) in protest against the mass eviction of traders from the city streets as part of the Metro’s “Mayor’s clean-up campaign”. Also the traders that have not been victimised joined in solidarity in a close-down of all markets in the city. Organised by the Workers and Socialist Party (WASP) and street traders’ organisations African Traders Committee (ATC) and South African Informal Traders Forum (SAITF), the march expressed the explosive anger of parents who find themselves unable to put bread on the table, pay school fees and rent. The Mayor received a clear message: by tomorrow all traders would return to the streets, and defend themselves against police brutality if necessary. The Greater Johannesburg Metropolitan Council (Metro) is since September 30 imposing a “clean-up” of the streets of Johannesburg. Without warning, Metro Police has evicted thousands of traders, confiscated goods and carried out random arrests without charge. Traders with and without permits issued by the Metro are targeted indiscriminately. While the clean-up is promoted as a drive to improve city life, it is in reality a dirty and top-down attempt at squeezing poor working class people out of the city. Meanwhile, the Metro has dramatically increased inner city rates, by up to 400%, recently. Metro cleaning workers have also been retrenched. The march was a resounding condemnation of the systematic xenophobia used by the ANC and the Metro Police in the “clean-up” campaign. Traders of every origin – South African, Mozambican, Nigerian, Ethiopian, Zimbawean, etc – came together as one. The WASP welcomes a campaign to clean up the City – but only on the conditions of those who work and live in the City, with transparent and representative involvement and control by street traders, workers and residents. The only way to really “clean-up” Johannesburg is through real efforts to create jobs, to provide affordable housing and services, including allowing the informal trading that services the working class and the poor in the inner city, townships and squatter camps, and to root out the corruption that in ingrained to the very core of the ANC government. WASP will continue to engage in the street traders’ struggle and to build the alternative that is needed to take on this challenge that is posed for the workers and poor: to fight for power over our streets, our livelihoods and our lives. The birth of first the Workers and Socialist Party and more recently the Economic Freedom Fighters has presented an historic opportunity to advance the struggles of the working class and deal the ANC government and its capitalist masters a major blow in the 2014 elections. After the watershed of Marikana the working class has begun a process of ideological and political clarification and organisational realignment that is seeing support for the ANC melt away across whole swathes of the population and the mighty Cosatu rapidly fragment. It is this process which, from different origins, has given birth to both WASP and the EFF and allowed both organisations to make rapid gains. In order to advance the struggles of workers, communities and youth, WASP believes it is the historic duty of the EFF and WASP to entrench and extend our gains by building the maximum possible unity between our two organisations. With the national and provincial elections just months away, this means urgently coming to an agreement for collaboration on the electoral field. But at the current stage of development of working class struggle, any unity must simultaneously aid the process of ideological and political clarification. Unfortunately, the leadership of EFF have rejected WASP’s proposals on how to begin building unity making cooperation in the elections impossible unless they reconsider. The letter below was sent by WASP to the EFF leadership on September 10 following a meeting between leaders of both parties. It presents WASP’s analysis of the present political situation and the demands we believe this places upon the shoulders of WASP and EFF, and advances proposals for the building of unity between our two organisations. Regrettably, we are yet to receive a reply from the EFF leadership. Regardless of the EFF leadership’s mistaken position described below, WASP will continue to extend the hand of solidarity and friendship to all genuine freedom fighters in the ranks of the EFF, for unity in action in the day-to-day struggles of workers, communities and youth. We hope that EFF members will work with WASP to change the position of the EFF leadership in order to seize the historic opportunity we are presented with. We commend the Economic Freedom Fighters (EFF) for approaching the Workers and Socialist Party for discussions to explore the possibility of collaboration. A full report of the meeting between us on August 19 was given at the recent WASP Interim Coordinating Committee meeting and our approach to the process was accepted. In summary, our view is that the EFF leadership’s proposal that WASP effectively dissolves itself into the EFF reflects a mistaken approach to the building of a new mass left political force. We are concerned that if you maintain this position, it would not only make it impossible for WASP and EFF to collaborate but would also risk setting back the development of the united working class party which history demands. As agreed at our first meeting on August 19, we here set out in writing the proposals we placed before you on that day, as well as our observations on the deliberations. We believe that a written exchange will contribute towards clarifying our respective positions. The talks between us take place against the background of the reconfiguration of South Africa’s political landscape. The Marikana massacre marked a new period in testing out the forces of the working class against those of the ruling capitalist class. More than any other of the numerous betrayals of this government, it revealed the true class character of the African National Congress (ANC) – the main political instrument for the rule of the rich, the mining bosses and the capitalist class as a whole. The massacre illuminated with blinding clarity that while the working class has the right to vote, we are politically disenfranchised. None of the parties contesting power is rooted in and led by the working class independently and on a programme setting out working class interests. Accordingly, millions of working class people – workers, the unemployed, youth and students – have intensified their search for a political and ideological alternative to the ANC. The births respectively of the WASP and the EFF have, by different routes and with significantly different features, come about in response to this situation. The working class is still at an early stage in the process of clarifying key ideological, political and organisational questions. Many know very clearly what they are against but are far less precise on what they are for. With the ANC unmasked as the main tool of capitalist rule in the eyes of millions and probably at its weakest point since it came to power – as evidenced by the steady decline in its real electoral support, the effective liquidation of the ANCYL and the fracturing of Cosatu, its most formidable organised base and electoral machinery – the historic opportunity to deal the ANC and its capitalist masters a significant blow in the 2014 elections will be at top of the minds of many. We believe that since both WASP and EFF are seen as answers to this question by significant sections of the working class, the two organisations should seek to collaborate in a way that both harnesses the combative strength of a united working class AND facilitates this process of clarification. An effective challenge to the ANC from the left would indeed be an important step along the path towards the future mass overthrow of capitalism and the creation of a workers government on a socialist programme. To let it pass by because of attempts to elevate individual party interests above those of the working class as a whole would be a dereliction of historic duty. Both parties agree to stand joint national and provincial lists of candidates under the name “Workers and Socialist Party / Economic Freedom Fighters”, or “Economic Freedom Fighters / Workers and Socialist Party”, pending consultation with the IEC on the exact form and legal requirements for such a list. The allocation per organisation and the position of candidates on the lists to be negotiated. Both parties will adopt a basic programme of joint demands, to be elaborated upon, but including as a minimum, (1) the nationalisation of the mines, factories and commercial farms at the commanding heights of the economy (2) a national minimum wage, (3) free education and healthcare, (4) anti-corruption, (5) a pledge for all MPs to take the average workers’ wage. Both parties will supplement this basic programme with their own specific programmes to be put forward independently. Both parties will maintain their organisational independence during this collaboration but will establish a mutually agreed democratic structure to coordinate the collaboration. Both parties agree to campaign to include other pro-working class, pro-poor and pro-youth forces on the basis of agreement with the basic programme, most notably the trade unions, granting representation on the list and participation in democratic decision making. Both parties will jointly campaign to maximise the vote for the joint lists but will maintain the right to public fraternal and comradely criticism on points of disagreement outside of the basic programme, agreeing to the prompt circulation of such fraternal and comradely criticism to one another. Both parties agree to extend a speaking invitation to one another for all significant public rallies, public meetings and press conferences. That WASP adopts EFF’s seven “non-negotiable” cardinal points. That the EFF will not accept any criticism of the seven cardinal points, while differences may be aired regarding other less critical supporting points. That all WASP members become EFF members. That WASP seconds two leading comrades onto the EFF’s national decision-making structure and that these two must be “naturalised” into the EFF, meaning they should be known as EFF representatives only, putting forward only EFF policies and not those of WASP. That WASP could nevertheless retain its separate identity, political organisation and campaigns. As is evident from these two sets of proposals, whilst WASP and the EFF share important common ground, there are fundamental differences on the approach to collaboration. These differences in approach are not technicalities but of critical importance given the differences that also exist on fundamental political and ideological questions, which we believe need to be open to be clarified through debate in front of the working class, which in the final analysis will pass judgment on our respective programmes. The EFF’s conditions for cooperation would deprive the working class of the opportunity for such debate and clarification. Instead of fraternal collaboration, the EFF position requires the subordination of WASP policies to those of the EFF and renders the right that the EFF claims it recognises for WASP to retain its independent identity meaningless. The EFF, and before it the ANCYL, have done the working class a service by placing nationalisation once again on the agenda of mainstream politics. The question is at the centre of both WASP’s and the EFF’s programmes and we believe this should be an acceptable starting point for collaboration, despite important differences. We argue that nationalisation, in and of itself, does not equate to “economic freedom” for the working class. Unless it is implemented on the basis of workers control and management, and is undertaken as a step towards the socialist reconstruction of society, it can become a vehicle for the advancement of capitalist forces using the state to accelerate the development, in SA’s case, of a black capitalist class in much the same manner as the National Party did to develop an Afrikaner bourgeoisie, or as certain East Asian states have done to further a highly oppressive and exploitative form of capitalism. The EFF appears to look towards this radical capitalist variety of nationalisation. WASP, on the other hand, fights for nationalisation on the basis of democratic control and management by workers and working class communities, undertaken as a step towards the socialist reconstruction of society. WASP stands firmly on a socialist programme – a programme for the take-over of the commanding heights of the economy by the organised working class and the democratic planning of production to satisfy the needs of the vast majority instead of the greed of a tiny minority. 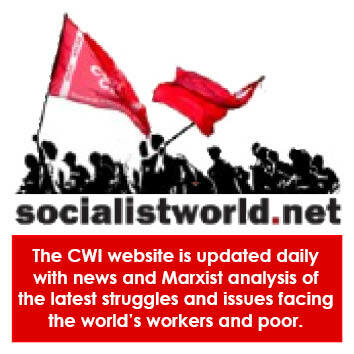 The struggle for the socialist transformation of society, on a world scale, is more than non-negotiable for WASP – it is the party’s reason for being to which all other points link. Meanwhile the EFF has pronounced itself “anti-capitalist” but has not made clear what it regards as the alternative to capitalism. Instead the EFF has popularised the idea of “economic freedom” in contrast to the “political freedom” ushered in in 1994 which remains largely meaningless for the black working class majority. We are of the view that genuine “economic freedom” can only be achieved on the basis of a socialist society, where the working class majority runs both its own state the economy. As pointed out in relation to nationalisation, in our view there are dangers that the battle cry for economic freedom could be used and abused to rally the working class only for its class enemies to climb on its back and install itself as a new set of oppressors and exploiters. Corruption is a burning issue for millions and is an issue the working class takes extremely seriously, with its direct impact on living standards. The struggle against corruption and for accountability of elected representatives and government officials is at the centre of so-called service delivery protests on a daily basis. WASP recognises big business and its political representatives, mainly the ANC, as the fountainhead of the corruption sapping the resources of the country. WASP believes the best inoculation against careerism and corruption and to hold representatives to account is by raising the need for elected representatives, at all levels, to earn no more than the average workers’ wage and be subject to immediate recall. It is not clear to us what EFF thinks of these safeguards, which is particularly worrying given the cloud of corruption-controversy that hangs over key EFF leaders such as Julius Malema. We have no illusions regarding the motives of those driving the campaign against Malema, or for that matter their own records when it comes to using generally corrupt relationships to loot public funds. However, these circumstances do not take away the responsibility, in our view, on the shoulders of the EFF leadership to respond to these perceptions by employing the utmost transparency in the financial affairs of the party and its leaders as well as clarity in rejecting corruption. We believe it is critical that WASP retains its own banner under which points like these can be raised independently in order to indicate, in an honest and principled way, where the road to genuine economic freedom lies. Unfortunately, the approach the EFF appears to be taking to collaboration – an effective dissolution of WASP into the EFF – would not allow this. A centralised monolithic party with a more or less self-appointed leadership is not the way to obtain the unity so crucial to the building of a mass left political alternative to the ANC. Given the vast range of political, working class, community and youth organisations that have mushroomed in South Africa as opposition to the ANC has grown, the only approach that can succeed in developing a mass alternative we believe is the creation of a formation of a federal character – an umbrella under which to unite different workers’, community and youth organisations on the basis of a common banner. This is what underpins our approach to the building of WASP at this stage. Participating organisations in WASP maintain their independent identity, and, outside of WASP’s basic programme, upon which agreement is necessary in order to join, are free to put forward their own views on issues and make fraternal public criticism where they disagree. This is not a weakness, but WASP’s strength. Unity cannot be imposed from above but has to be achieved through debate and discussion, the comradely thrashing out of differences and by joint action. Still, we are not so conceited as to think that all working class organisations will come under our banner all at once. In each case we discuss and work out how we can best work together, and in some cases the dialogue continues to find ways to work together even when an organisation remains outside of the WASP umbrella. We have not approached the discussion with the EFF with the demand that you come under the WASP umbrella, but rather, at this stage, with a proposal for cooperation by forming an electoral bloc for the forthcoming elections. We trust you will take the points we have raised in this letter in the fraternal and comradely spirit in which they are intended. We remain convinced that there is enough common ground between EFF and WASP to make cooperation imperative and will, as ever, strive to build the maximum unity in campaigns and mass actions. However, as set out above, cooperation on the EFF’s terms as presented so far is impossible for WASP to accept. We appeal to you and to the members of the EFF to reconsider your position, failing which we will regrettably not be able to work with you. We look forward to your views and eagerly await your reply. We would appreciate if you could respond in time for the next WASP interim coordinating committee meeting which will take place on September 21.